For many alumni and current students, the simple mention of the Black Bears or Orono brings up the same mental image time and time again, Alfond Arena. From the student section precariously hanging over the end lines to the exposed wooden beams that seem more like a cabin than a sports venue, Alfond will be forever linked to the college of our hearts always. 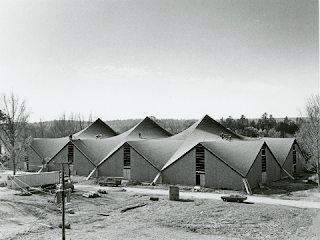 So for this Throwback Thursday we go back 37 years ago this week when Alfond was in the final stages of construction. A radical departure from other college venues at the time, Alfond’s unique parabolic roof shape allowed for snow to slide off the outside and for the thunderous cheers of fans to echo on the inside. Originally built with a capacity of just 3,800 the arena has seen numerous renovations through the years, most notably the 1994 expansion which provided additional seating along the sides of the ice to increase capacity to roughly 5,200. People are quick to forget that prior to the arena’s completion there was no hockey team at Orono, just intermural teams that would play on temporary outside rinks. Alfond provided not just a building but the birth of a hockey program that would go one to win two national champhionships and played host to countless future NHL stars. And while construction crews labored into the fall and winter as shown in the picture, the arena would officially open on February 5, 1977 with the first game being held on November 11, 1977 with Harold Alfond ceremonially dropping the puck to open the facility.